Stainless Steel 316H Plates Supplier, SS 316H Cold Rolled Plate Exporter, Steel 316H Hot Rolled Plate Dealer. Marc Steel is an acknowledged exporter and trader of SS 316H Plates, which are rust proof and reliable. Along with maintaining the quality at its finest, our specialists help us in upholding the appropriateness in supply of both the orders, large and small. Stainless Steel 316H PlatesThe superior content of carbon of Alloy 316H Plates offers advanced yield and tensile power than SS 316 / SS 316L Plates and its structure delivers first-rate stoutness down to cryogenic temp. 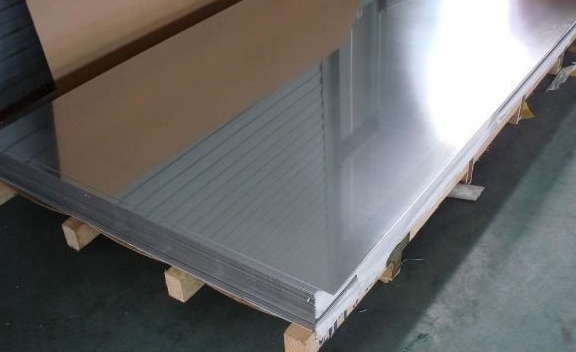 Buy 316H Stainless Steel Plates at reasonable cost from us. Alloy 316H Sheets is willingly brake or roll shaped into a diversity of components for functions in the architectural, transportation and industrial fields. The structure of Alloy 316H Coils gives this alloy superb robustness. Advantages of using Machining Grade 316H Steel Plates comprises: Augmented content of carbon with heat resistant attributes, higher tensile yield potency, higher long and short term of creep power, etc. Machining Grade 316H Steel Sheets offers itself well for its usage in gas, chemical and petrochemical industries. SS HOT ROLLED PLATES DISTRIBUTORS, UNS S31609 STAINLESS STEEL HR PLATE EXPORTER, STAINLESS STEEL 316H PLATE, SS 316H PLATE DEALER, 316H SS PLATES STOCKIST, STAINLESS STEEL 316H HIGH QUALITY PLATES MANUFACTURER & SUPPLIERS. ASTM A240 SS 316H CHEQUERED PLATE SUPPLIER, SS 316H COLD ROLLED PLATES, STAINLESS STEEL 316H CR PLATES EXPORTER, 316H STEEL CR PLATES STOCKHOLDER, SS 316H HIGH QUALITY PLATES, LEADING MANUFACTURER OF STAINLESS STEEL 316H PLATES EXPORTER IN INDIA. Stainless Steel 316H Steel Sheets has superior power at high temp and is being used for pressure vessel and structural functions at temp beyond 500 Deg C. The austenitic structure of SS 316H Steel Sheets (UNS S31609) as well offers this grade outstanding hardiness. The increased content of carbon of Stainless Steel 316H Coils offers a greater yield and tensile potency. SS 316H Coils is a superior variant of carbon of SS 316 forming the alloy more apt for its usage in functions where high temperatures are in attendance. Colombia, Afghanistan, Azerbaijan, Bangladesh, Jordan, China, Yemen, Pakistan, Macau, Puerto Rico, Bhutan, Ukraine, Iraq, Japan, Kazakhstan, Nigeria, Netherlands, Lebanon, South Africa, Morocco, Mexico, Canada, Vietnam, Bulgaria, Italy, France, Russia, United States, Trinidad & Tobago,Tunisia, Belarus, Indonesia, Peru, Lithuania, Costa Rica, Portugal, New Zealand, Mexico, Sweden, Qatar, Mongolia, United Arab Emirates, Kenya, Chile, Nepal, Egypt, Ecuador, Thailand, Serbia, Switzerland, Poland, Malaysia, Israel, Tibet, Hong Kong, Estonia, Slovakia, Romania, Ireland, Singapore, Zimbabwe, Argentina, Nigeria, Germany, Algeria, Venezuela, Oman, Bahrain, Taiwan, Spain, Kuwait, Saudi Arabia, Chile, United Kingdom, Greece, Gambia, Belgium, Denmark, Norway, Austria, Libya, Turkey, Bolivia, Brazil, Iran, India, Sri Lanka, Ghana, Finland, Philippines, South Korea, Australia, Croatia, Hungary, Poland, Iran, Czech Republic, Angola, Gabon, Namibia. Kuala Lumpur, Vadodara, Pimpri-Chinchwad, Jeddah, Ahvaz, Toronto, Mexico City, Seoul, Baroda, Bhopal, Milan, Ernakulam, Petaling Jaya, Thiruvananthapuram, Vung Tau, Jamshedpur, Port-of-Spain, Howrah, Ulsan, New York, Lagos, Montreal, Ho Chi Minh City, Geoje-si, Colombo, New Delhi, Visakhapatnam, Caracas, Ranchi, Kolkata, Algiers, Manama, Madrid, Chiyoda, Al Khobar, Chandigarh, Lahore, Los Angeles, Chennai, Houston, Sharjah, Brisbane, Hyderabad, Gurgaon, Navi Mumbai, Dubai, Aberdeen, Dallas, Sydney, Singapore, Dammam, Kanpur, Coimbatore, Edmonton, Thane, Doha, Faridabad, Istanbul, Hong Kong, Gimhae-si, Bengaluru, Moscow, Kuwait City, Nashik, Jaipur, London, Riyadh, Bogota, Rio de Janeiro, Nagpur, Mumbai, Surat, Al Jubail, Karachi, Courbevoie, Abu Dhabi, Secunderabad, Ankara, Indore, Rajkot, Melbourne, Noida, Tehran, Pune, Ludhiana, Muscat, La Victoria, Hanoi, Cairo, Jakarta, Ahmedabad, Perth, Busan, Bangkok, Santiago, Granada, Haryana, Calgary, Atyrau.